Jon Wheeler has been releasing dark ambient music and soundscapes under the name Petal since 2007. Primarily a banjoist, Jon is a multi-instrumentalist who for the past 15 years has written and performed music in a variety of styles, from straight ahead bluegrass to acoustic-acid fusion and cabaret. In the spring of 2006, Jon ventured with a troupe of like minded strangers into the hills of Western North Carolina, with the intent of laying down some drones using only the acoustic instrumentation typical of a modern bluegrass quartet. 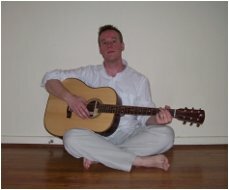 The group never found its chemistry, but Jon returned home with an arsenal of banjo-centric sound design techniques and immediately began publishing his experiments online via a couple of podcasts. In 2007, Jon began releasing music under the name Petal as a means of consolidating his efforts and venturing into the realm of internet radio and netlabels. Although he long ago began incorporating guitar and synthesizers into his experiments, the balance of wood and metal tones along with the rhythmic patterns unique to the banjo have kept it the instrument of choice for Jon's samples, loops, and drones. Earth Mantra is very happy to be bringing the music of this uniquely talented artist to our listeners, and hope there is much more to hear from Jon in the future.